We can only define a circular economy if we look to the end state that we want to achieve, argues Metabolic’s Founder and CEO Eva Gladek. Before I outline the seven pillars themselves, let me tell you how we got there. The circular economy is a term that has gained a great deal of popularity among both businesses and governments over the last few years. As with other popular terms, with its growth in usage, the number of ways in which the term is defined have proliferated. There is no single group with the undisputed authority to define what the circular economy means exactly. While some consensus is developing among the different players working in the field, there can still be a lack of clarity about what “circular” actually means in practice. Many groups define the circular economy in terms of the types of activities and concepts associated with it: The use of new business models, like leasing, collaboration across supply chains, using waste as a resource, etc. However, these types of characterisations ultimately don’t tell us what the circular economy actually is, because they don’t describe its end state: What will the world actually look like when it is “circular”? Without answering this fundamental question, we lack a common understanding of what we’re actually trying to achieve, which makes it impossible to measure progress in any meaningful way. If we’re designing a product, for example, and have only limited resources, which we can either invest in more expensive, certified, renewable materials or in the up-front costs needed to set up a product leasing scheme, which will produce the more “circular” result? If we take the activity-based definitions of a circular economy, which suggest that making use of any of these practices makes something circular, then we don’t get much insight on what choice to make. And in fact we know that simply choosing for renewable materials does not always result in less environmental impact or greater value delivery—nor does adopting a leasing scheme. Over the last five years of advisory and development work in the field of the circular economy, we at Metabolic would frequently run into the issue of needing to handle trade-offs in circular design and decision-making, or needing to quantify progress towards a “circular” goal. For this reason, it became essential for us to define what the performance characteristics of a fully circular economy would be. A great deal of focus in the circular economy field is on the management of materials and ensuring that resource cycles are closed, in a similar way that occurs in natural systems (in the context of an ecosystem, water and nutrients are continuously cycled among different uses). So we began by taking this principle to its ultimate conclusion: In a circular economy, all materials should be used in such a way that they can be cycled indefinitely (just as they theoretically can in nature). This statement, however, implies some additional complexities: We don’t just want these materials to be theoretically possible to recover—it has to happen on a time-scale that’s relevant to people (so, if we create wastes that need thousands of years for recovery, potentially in the case of nuclear wastes, that doesn’t exactly address our original goals or criteria). Aside from this time-scale issue, there’s an important recurring principle within discussions of the circular economy, and that is around the preservation of value and complexity: We want to ensure that materials can be cycled at the highest value possible, preferably as whole products, then as components, and finally recycled back down to basic raw materials (which is extremely costly in terms of energy). Even this cascade is oversimplified here, and can look quite different depending on the context. For example, if you have a very inefficient energy-using-product like an old refrigerator, it may actually be systemically better in terms of energy impact to just scrap it and replace it with a newer model than extend the life of the whole product. But the general principle of preserving complexity is clear. Thinking through how materials should ideally be handled in a circular economy leads to all kinds of further conclusions regarding material toxicity, the scarcity of certain materials, the persistence of certain materials in the environment, and many other parameters. On this basis, we have developed a set of circularity factors that provide guidelines for the optimal use of materials for different functions. These are metrics that we use to define a material based on its properties such as recyclability, scarcity, toxicity, etc. Using these factors, we have developed shorthand recommendations for how certain materials should be used to uphold circular economy objectives. But of course, in doing this exercise, we also immediately realised that once you are developing goals for how materials should ideally be managed, you also run into many adjacent issues. Materials are just one type of resource in our economy, where all flows are ultimately connected and influence one another. In a world with infinite and free energy, it’s very easy to design and develop systems that will fully recover all materials through extremely costly and energy-intensive recycling processes (which is how we currently recover metals from electronic waste, for example). However, because energy is also a constraint in our current system (even renewable energy is generated by devices that are made of scarce materials) and often comes with high levels of environmental impact (for instance, Greenhouse Gas emissions), we also need to treat it as a scarce resource that should ideally be conserved. Ultimately, in a circular economy, all energy should be supplied from renewable or otherwise sustainable forms (like geothermal, which is not technically renewable, but we consider it a sustainable resource). To achieve this, the efficiency of our energy use also needs to increase significantly. Even though we know the total amount of energy available on the planet is not a constraint (the sun produces more than enough for everything we need), collecting that energy in usable form does require the use of scarce materials, which are a constraint themselves. As you continue to explore the implications of striving for a fully closed, circular material cycle as a cornerstone of the economy, you ultimately find many other connections throughout the economic system that need to be arranged in a way that uphold broader human ideals. An important note on these seven characteristics is that in making decisions not all of these outcomes should be equally prioritised. When we consider the state of the global system, there are some areas that are under extreme threat and close to key systemic “tipping points.” Though climate change is one of these areas, there are some that are even more severely impacted, like biodiversity loss. 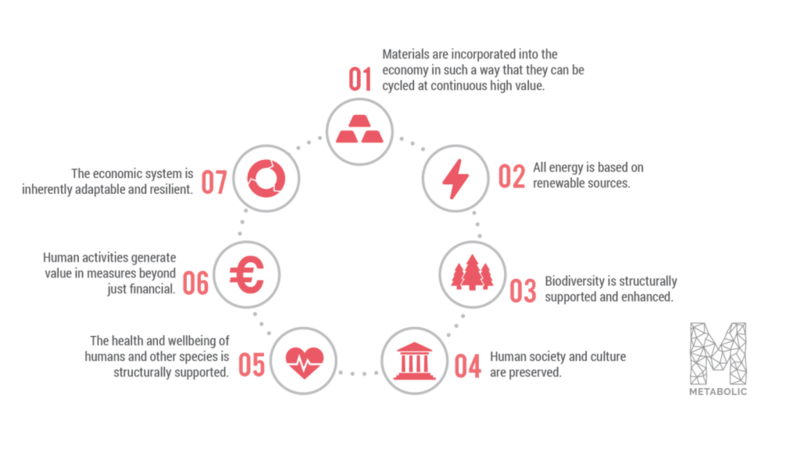 Taking all of these emerging insights together, we have formulated our own working definition of the circular economy: The circular economy is a new economic model for addressing human needs and fairly distributing resources without undermining the functioning of the biosphere or crossing any planetary boundaries. You’ll find the pillars below. Once you have these clear performance outcomes in mind, then the process of natural selection, so to speak, will support the evolution of economic rules and incentive structures that actually fulfill these end results. Technologies and business models that ultimately support not just one, but all seven of these goals, will be the ones that rise to the top as the most successful. So, we don’t arbitrarily support “product-as-a-service” models because they have been associated with the circular economy, but we actually look at where, and under which conditions, these models actually result in better circular performance across the board. For us at Metabolic, these seven characteristics of the circular economy are an essential tool. With it, we are able to make sure that we’re approaching problems in a systemic manner. Your newly efficient light bulbs require the use of toxic and hazardous materials). Perhaps even more importantly, as we have refined these seven pillars over the years, we have been able to translate them into quantitative tools—metrics and indicators—that we can use for evaluating the circularity of products, projects, businesses, and investment portfolios. For instance, we are currently developing a set of indicators for the Municipality of Amsterdam in order to assess the circularity of new building projects. Using this tool, City officials will be able to determine which of the proposed projects during a tender process should be selected for development, thus keeping Amsterdam’s urban development on a circular path. We’ve developed this set of characteristics that define the circular economy through a trial and error process over the course of around two hundred projects. For us, they offer clear signposts for how to make genuine strides towards a circular economy. We invite everyone working in the circular economy field to make use of this framework and the tools we have developed around it. We see it as a complementary resource to the lists of business models and circular economy approaches that are already more broadly in use. But as practitioners, we continuously refine our ideas as we run into new situations and are faced with new trade-offs. You can read more about Metabolic’s Seven Pillars of the Circular Economy here.